Nigerian-born winger Bobby Adekanye has been rated as 'touch and go' for Liverpool's next match in the Premier League 2 against Derby County U23 on Sunday, October 21. 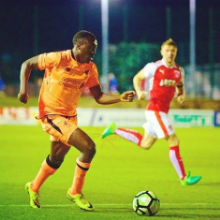 The out-of-favor Netherlands youth-teamer had to come off nine minutes before half time in Liverpool's 1-1 draw with Napoli in the UEFA Youth League on October 3 after suffering an ankle injury. It was initially feared that Adekanye faces a lengthy spell on the sidelines as he was seen on crutches after the game at Stadio Pasquale Ianniello (Frattamaggiore), but Liverpool U23 boss, Neil Critchley has some positive news on the injury. ''Bobby is touch and go at the moment,'' Critchley told the Liverpool Echo. The 19-year-old has figured in nine matches for Liverpool's youth teams this term, netting three goals including two in the UEFA Youth League. Adekanye trained with Liverpool's first team last month during the international break.